I love food courts. They are convenient, air-conditioned and sometimes has really good food if you know which stall to go to. 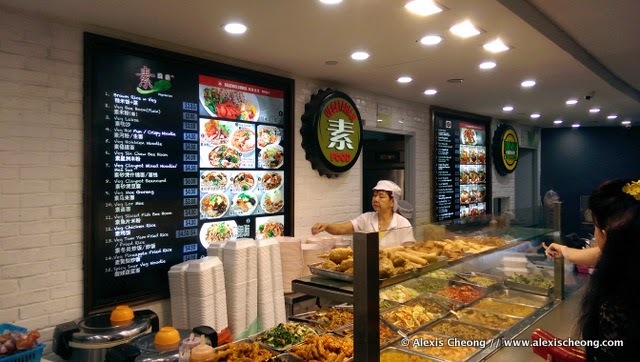 In recent times, food court brands have also ramped up their offerings in making these food courts a much enjoyable place to dine at regularly, for a price still affordable for most masses. That's why I think it is quite a feat for Health Promotion Board to have Kopitiam onboard as a participating partner in their Healthier Dining Programme to offer Healthier Choices at every single stall. This way you can mind your calorie intake by ensuring what you order from the myriad of dishes is a healthier choice. 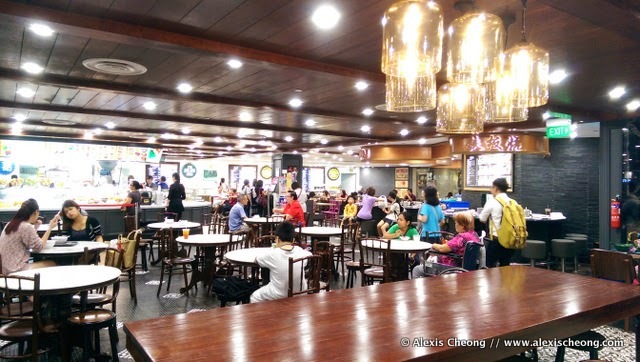 It was with that agenda in mind when I visited the Kopitiam at Tiong Bahru Shopping Centre a few weeks ago and was pleasantly surprised by the retro but modern décor. It was renovated a couple of years ago and features a large selection of food stalls, including the popular Pepper Lunch Express. 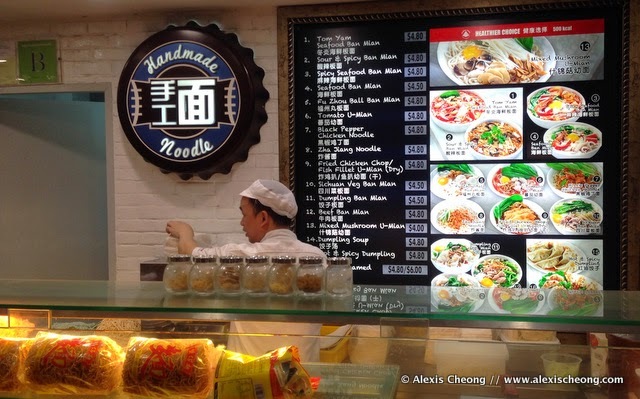 Can you see that at each stall, there is a wide rectangle at the top of the menu featuring the Healthier Choice item? Here’s a closer look. The item is typically the stall’s default or mainstay item too. My sister and I had a hard time choosing from so mny food stalls, but after some deliberation we decided on a few to taste. We started with a classic – the YTF. 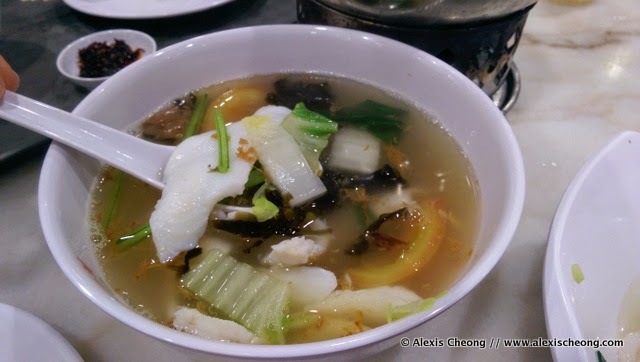 Yong Tau Foo is a huge hit among Singaporeans because you can pick and choose your favourite ingredients, and add it to soup or have it dry. It’s almost like the Singaporean variation of the Western salad (except instead of greens we have rice noodles). The Healthier Choice item listed was the YTF Soup with up to 5 items, which are a mix of fried/non-fried items. I chose to have my ingredients with mee tai mak, or mouse-tail noodles because I haven’t had it in ages! What I found was the soup was sweet yet light, not oily, and complemented the ingredients very well. 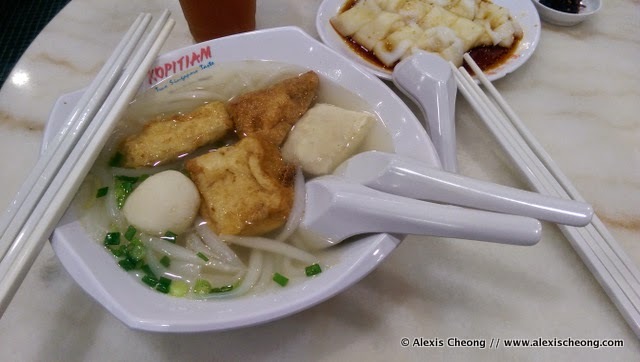 Another of my lunch favourites that I look for frequently at food courts is the fish soup. Here the seaweed added the umami dimension. Even though the fish was a little bit on the sweet side, it was still a very good bowl of soup. Lastly, something special. We had the Mini Steamboat from a specialty Chinese cuisine stall called Ma La Xiang Guo that specializes in spicy hotpot. Our Mini Steamboat came with golden mushrooms, tofu, some crabsticks and fishballs. We could choose from 3 different types of soup (Tom Yam, Mala, Yang Sheng) and we got the last one (ginseng) from 3 meat types - chicken, seafood or pork. We chose chicken. The mini steamboat was surprisingly hearty and the soup was really herbal tasting, which is a good thing. Normally soups are just water with flavouring or essences, but this is made with the real stuff. The ingredients were fresh and satisfying. We were so stuffed afterwards! I definitely do not recommend someone to have 3x 500-calorie meals at one go. I made it up by going shopping afterwards. 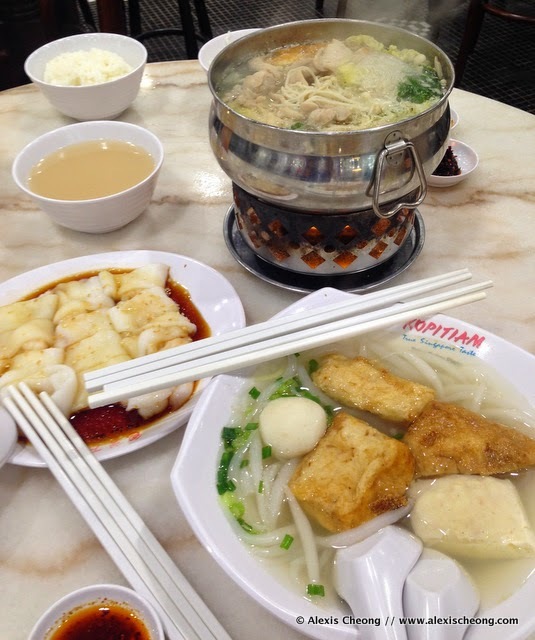 To find your nearest Kopitiam outlet, visit their website.